Store gift cards and gift certificates to shop. Almost every company that sells a product line has given away shopping credits to their sweepstakes winners. It’s a natural for a merchant. What better and more thrifty way to promote their stuff than by giving away their own merch? Cash. Yep, cold hard cash is a very nice prize win, and it’s given out more substantial amounts than you would ever believe. Large companies tend to give out cash prizes as checks. Smaller companies may award smaller amounts, like a $25 Visa gift card. Personally, the oddest cash prize payment was 18 American Express gift certificates my mother received in a UPS special delivery envelope. Lots of people are concerned about the notification process and would like to know how to be prepared. Sometimes when you win any of the above, the prize will show up unexpectedly at your door. (In the case of a trip win, you could be notified via UPS or FedEx courier.) More often, you’d receive an email notification tell you a great prize is yours. It’s your responsibility to answer the sponsor and confirm your information within 48 hours (usually). If you miss the notification and don’t answer, the sponsor would be forced to pick another winner. 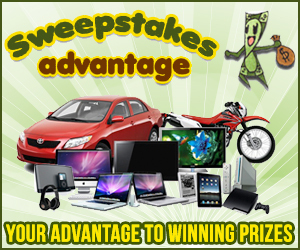 Always be alert for your cash, trips, merchandise and gift certificate wins when you enter giveaways and sweepstakes. Sometimes I miss winner emails because I get so many messages. So far I have not missed anything major but I’m concerned. Suggestions? I love to enter giveaways and win all kinds of off the wall stuff. My husband just shakes his head. Ha ha! kristiedonelson(at)gmail(dot)com Thank you. Open a seperate email to use for notification. I have one for blog emails and one for entering giveaways and sweepstakes . I am a advid giveaway and sweepstakes person. I entet more blog giveaways than company/business sweepstakes. I have won so many things. Last year I spent no money at Christmas. I entet anything that I can use or can be used as a gift. I have even got the hubby into it. He does more sweepstakes than blogs. The biggest thing I have won? Last week I won a iPad. The biggest the hubby won? A tie between a Pontoon Boat and A 2-night stay in Indianapolis. 4 front row seats to see the Eagles concert with back stage passes to meet them and we get to go out to a late dinner with them after the concert.